It’s been said countless times the better the purses, the better the horses. It’s no different now than it was back in last century’s glory days of harness racing in Illinois. Once again it’s a proven fact. Just take a look at Friday night’s Hawthorne card and its Robert S. Molaro eliminations for ICF pacers age three and up. The ICF stake lured a host of state-bred pacers back to the local scene with a $45,000 purse on the line on next Saturday’s Night of Champions. Sixteen ICF male pacers passed the entry box with a $500 entry fee by their horses and seen of them are coming in from out of state for a pair of $15,000 elimination events and a shot at next week’s $45,000. The ninth race second Molaro elim lured invaders Unlocked, the stake’s 2016 winner, from western Pennsylvania, last year’s Molaro titleholder Gibbs, a regular in 2018 on the Ohio circuit, Evergreen Elite from Indiana and Fox Valley Rebel from Lexington’s Red Mile in Kentucky. They’ll be challenged by a trio of local pacers—Slznurgerslzburger, Cole Heat and Dakota Roadster. Coming to town to compete in the first Molaro elimination that will go as the Friday opener are the Indiana invaders Stonedust, a frequent starter in the Hoosier Park Opens, and Sporty Redhot, winless this year, along with Dakota Jack from Pocono Downs in eastern Pennsylvania. It’s take a fifth place finish or better in either elimination to advance to the September 22nd Molaro championship. Unlocked, now a seven-year-old, won the Langley Final at Balmoral Park’s 2014 Super Night at the age of three, the first of three consecutive years with a season mark of 1:49.1 or faster for trainer Norm Parker and owner the Megan Rogers Racing Stable of Chicago. However, the Duneside Perch gelding with a career bankroll of $532,784 has raced only a total 12 times over the past two seasons. He was sidelined in late April of 2017, missing last year’s Molaro stake. Unlocked came back after almost 14 months off and made four unsuccessful starts this past June and another two month layoff then followed. Unlocked has been pointed for the Molaro and has gotten ready for the ICF stake with a pair of recent winning qualifiers in the five-eighths oval at The Meadows, a 1:55.2 mile on a “good” track with two seconds allowed, and a 1:53.3 clocking a week ago on a fast surface. The Sagebrush gelding Stonedust has blossomed as a 4-year-old after going just 1-for 4 as a 3-year-old and banking $6,200. 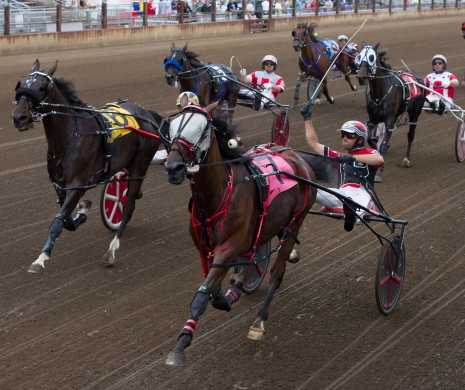 This year the ICF pacer has nine victories, over $91,000 on his card and a mark of 1:51 flat at Hoosier Park. Stonedust competed at Yonkers from February through early April and made six trips to that New York track’s winners circle. 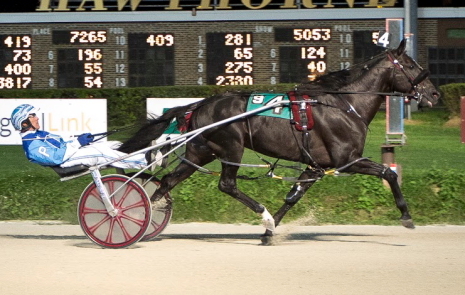 He was shipped to Hoosier Park under the care of Jeff Cullipher and promptly won at Open 3 event. In May Stonedust captured back-to-back Open I Paces there. He’s currently trained by Tim Clevenger. The all-important fourth and final legs of four Night of Champion stakes series are sprinkled throughout the 13-race Friday card. The Terry Leonard Stable’s Fox Valley Gemini (Casey Leonard) returns to competition in the third race first $15,000 Carey split after his 16 race unbeaten streak was snapped at Springfield and a month layoff followed. Among his challengers is Dane May’s Dandy Dude, an impressive winner in Du Quoin’s Dudley Hanover stake with a 1:51.1 mile. Springfield and Du Quoin State Fair champion Fox Valley Halsey (Casey Leonard) and last week’s Incredible Tillie leg victor Fox Valley Torrid, clash in the fourth race “Tillie” for ICF 2-year-old filly pacers. Another “must-watch” race tonight is the $15,000 seventh race Fox Valley Flan with the top three division leaders—Encantado (Casey Leonard), Louzotic (Kyle Husted) and E L Game On (Kyle Wilfong)—all squaring off. Springfield champ Encantado looked to have her Fox Valley Flan leg wrapped up when she suddenly went off stride in mid-stretch, opening the door for Louzotic from the Steve Searle barn who trotted right through and won for the fifth time in nine career starts. The tenth race second Carey divisions brings out the one-two-three finishers of the Springfield Final—You’remyhearthrob (Kyle Wilfong), Backstreet Lawyer (Mike Oosting) and Al’s Briefs (Travis Seekman).